I hope you all are planning to take some time for yourself over this holiday weekend. Is anyone taking part in the Black Friday frenzy? I do my best to stay away from the stores over this weekend. I’ll be going home to visit my mom and siblings. This is the first Thanksgiving in about 5 years that both of my nieces will be home for the meal, so I am looking forward to that. On Friday I am going with my brother to meet a family of Amish quilters. My brother lived in Wyoming county for a while and met the family through his volunteering with the EMTs. The ladies of this family are beginning a hand quilting business and have invited me to come have a look at their work, and give them some input as an “English” (non-Amish) city quilter. How could I resist this chance?! Hoping for some Amish baked goods too while I’m there. I’ve been to several Amish farms, but have never gone inside the house. I am very curious. Will give a report next week. I came across this blog hop from Aurifil threads while keeping an eye on Pat Sloan’s doings. She is a rep for Aurifil along with all her other ventures. If you enjoy stitchery, I think you’ll enjoy these free patterns. I did my last redwork project with Auriful 12 wt. thread, instead of embroidery floss. I would highly recommend it. One strand of 12 wt thread is equivalent to 2 strands of embroider floss (got that info from DMC and Auriful both). Here’s the link to the stitchery hop-all Christmas or winter ornaments. We’re behind a bit, but it all is archived. Happy holidays to you and yours. Wishes for safe travel for all of those away from home. Back next week! But TODAY, here is some fun for you all that includes BOTH, out past teacher, Beth Ferrier and the next one – Pat Sloan: Beth is a guest on Pat’s radio show and you can see all the info HERE! Hope some of you will see this in time to tune-in and listen! OK, so while I am on this coffee break, let me share few other finds with you: this is “after-Houston” time in quilting world (Houston being the place for the famous Quilt Market, where all the newest quilt-related products debut for our creative pleasures! ), and lots of blogs that I follow have “Houston reports” and such things – great place to hear about new stuff in quilting! Through Frieda Anderson’s blog, I found something really cool: THE BIG LOOK ! So for any of us needing a bit of help with tiny details, or just a bit easier job for our eyes, this could be the perfect product! Also, check other neat stuff that Frieda liked at Houston, on her blog. While in virtual Houston Market visit, look at the booth of one of the biggest fabric manufacturers, MODA! I just love the look of those paint stirring sticks “dipped” in fabric!! (third photo down) I might just have to play with those…well, maybe in another life, but hey, one can dream! Dream…until you “wake-up” and it is holidays time!! Time to be thankful, cook, eat and be with family and friends! Well, don’t you think we should do these things ANY time of the year? Specially be thankful…but OK, let’s not get philosophical here. Back to cooking – I always like to try something new at this time…to possibly add to the -tried-and-true-never-to-change traditional family menu. Do you? Anyway, saw this last night and had to save it -what do you think? In a small bowl, beat the first six ingredients until combined. Shape into a ball; wrap in plastic wrap. Refrigerate for 1 hour or until firm. Using the red pepper, form the turkey head, neck and wattle. For beak, cut a small triangle from summer squash; attach with cream cheese. Add eyes, using brown and plain cream cheese. 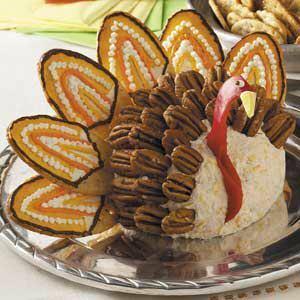 Insert pecan halves and decorated crackers into cheese ball. Serve with assorted crackers. Yield: 1 cheese ball (3 cups). I just might try that, to add to some always-repeated family traditions! Speaking of those family traditions – one of them in my family is becoming this really nice PEAR CAKE that I tried some years before and my husband just fell in love with. The link will take you to one of the old posts on my blog, that has the recipe – so from my family to yours, ENJOY and have a wonderful Thanksgiving! Just gave my “sort of” final report about seminar 2012 at this week’s guild meeting. Already Kit, our chair of national teachers, is telling me we need to think about what classes to ask Pat Sloan, our 2013 teacher, to do for us in the fall. This will be the first year we will have only one national teacher-all of our eggs in one basket so to speak. Pat has a great presence on the web. Start by visiting her blog to get familiar with all she does. Look around on her sidebars for freebies, and links to her other enterprises. If you are interested have a look at her listing for classes she offers and let us know if there is something you’d like us to bring to seminar 2013. You can reply right here, or contact me or Jan Reilly or Kit Willey via the contact information in our guild roster. More about Pat to come throughout the year. I’d love it if we could have a show and share of “Pat projects” at seminar some how. Think about trying out one of her patterns this year. Finally…the last Lucy Goosey block. It’s a nice easy variation of the Friendship Star block. Several variations are mentioned in case you need a few filler blocks. If you have been to any of our quilt shows, I’m certain you have admired the beautiful quilts made by one of our guild members, Lauren DeVantier. Her piecing and applique are wonderfully done, and always complemented so nicely by her friend Norma Chapin’s quilting. Lauren is one of the 10 finalists in the Morton Masterpiece contest. Photos of the quilts made by each finalist are posted here and you can vote for your favorite. Voting for the winner is open now and will close on December 15. The quilts had to be made totally with Jo Morton fabrics, and could be a maximum of 60″ square. Lauren’s is just under 57″ square. Use the magnifier option at the site and have a close look at the detail in her blocks. I was told that she started this quilt in April. All of the quilts are amazing to me, but we have a favorite, don’t we? GO VOTE! Here’s the link again. I should have visited her blog sooner. Beth Ferrier writes about her trip to our seminar in her blog. Some of you may recognize yourselves in the photos. She was quite impressed with Niagara Falls. Here’s the link. In case it doesn’t take you directly to the right spot in her blog, you are looking for the September 19 entry. 1. Our president, Kathy T., has asked me to post this for you. Awhile back, at a guild show and share, Kathy shared a quilt with pieces like puzzle pieces. She had lots of inquiries about the pattern, which she found on the internet. Here is the site for you. You can see a photo of the quilt in the photo gallery at our guild site. The link to that is in the side bar of this blog. 2. I just discovered that I never posted the October, final, Lucy Goosey block directions! So sorry for that negligence. I found it just now in the list of “draft” posts. I’ll finish that up and get it posted ASAP. 3. Are you going out to the “old” Pine Grove workshop location for Judy and Bonnie’s Christmas Open House? It’s this weekend and next. I’m sure that many of you have fond memories of their seminars each spring, of shopping for yards and yards of gorgeous fabric there, of the friendship from the ladies in the shop. I’ll venture that many of you got your start in quilting through Judy’s shop. I went this morning and it brought back many fond memories. 4. How are you doing on your quilted Christmas gifts? Anyone willing to share the details of what you’re working on? The quilts for my two nieces are finished but I cheated a bit. They were both samples for classes I taught in the course of this past spring and summer. My sister, their mom, likes a quilted gift too. She got a Christmas quilt last year, so probably will get a runner or two this year. I’m thinking I’ll make some quilted mats to use like “chargers” and put them with some clear glass dessert plates. Then I can give more “chargers” for upcoming occasions. I make mine hexagonal using the 60 degree ruler to cut the hexagons, and bring the backing up around the edge to the top for a fast and easy finish. I use large prints with easy quilting and the fabric does most of the work. Love that 60 degree ruler; I think it’s my favorite of all the specialty rulers I’ve purchased over the years. My friends read this blog so can’t give away any of my plans for those gifts (plus I haven’t made a final decision and started on them yet), but, ladies, they will be from fabrics already in my stash. If you had seen my stash, you’d know that is not much of a hint at all! 5. I’m way behind on the leaf removal and “tarping” of lawn furniture. If it ever dries out a bit in the back yard, I’ll get back to it. Hate this end of the garden season-planting and anticipation are way more fun than cutting down and putting the garden to sleep.